Gig harbor has transformed itself from a quaint little fishing town into a quaint little city, located in Pierce County, 20 minutes away from Tacoma, across Narrows Bridge. While the area has seen a large growth in residential housing and services, the essential elements of Gig Harbor community - yearly festivals, small businesses, fishing, and historic areas - have stayed intact. As always, while you browse the Gig Harbor real estate below, if you have any questions, please don't hesitate to click the “Request More Information” button when viewing the details of a property. As Gig Harbor experts, we can provide you with disclosures, past sales history, plus our objective analysis of the listing price based on recently sold properties nearby! Take advantage of our industry-leading tools to make your property search as easy as it possible and be sure to register for a FREE account so that you can receive email alerts whenever new Gig Harbor real estate for sale hits the market. If you’re seeking to sell your Gig Harbor property, email us directly for a comprehensive listing analysis and to learn more about the cutting edge marketing strategies we’ll use to sell your home quickly for top dollar! 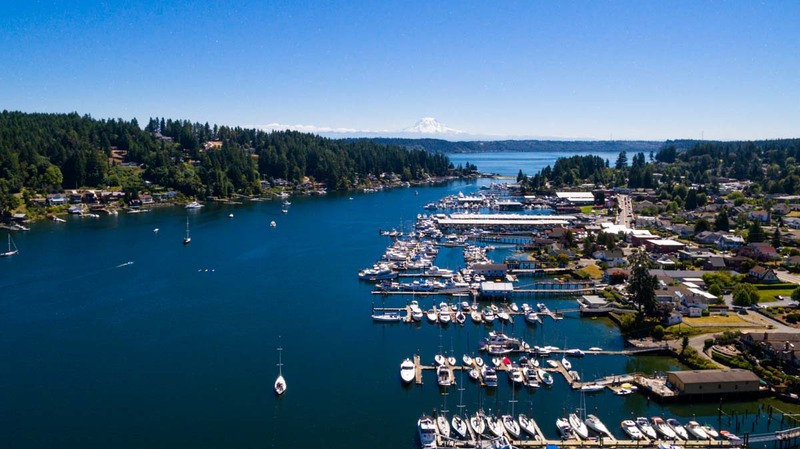 Gig Harbor has been dubbed the "Newport Beach of the Northwest" for its beautiful deep water ocean frontage, many marinas, and abundance of luxury homes. Property values amid Gig Harbor real estate extend into the millions, with high end homes for sale including all the finest amenities and features of oceanfront real estate, like spacious, well manicured properties, custom designs, patios, and hot tubs for after the ocean swim. The community also features a wide variety of view homes, with Mt. Rainier, and Olympic National Park visible on either side of the community, as well as beautiful Puget Sound and its jagged coast. Single family homes for sale, including a wide range of affordable listings, at the norm in Gig Harbor Washington real estate at this time. Gig Harbor also functions as the gateway to the Olympic Peninsula, the National Park, and its stunning central region of snow-capped mountains. Regional parks throughout Puget Sound can also be accessed via Gig Harbor. Gig Harbor's importance as a fishing community stretches back to the earliest days of Washington State. The area was named in 1841 after a crewmember in a small boat spotted the harbor, called the captain's gig, and led a group of other boats to take refuge here during a storm.